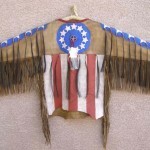 This is a ONE-OF-A-KIND, HAND PAINTED, SIOUX, BUCKSKIN WAR SHIRT by experienced artist Rudy Silvas of the Tigua people. 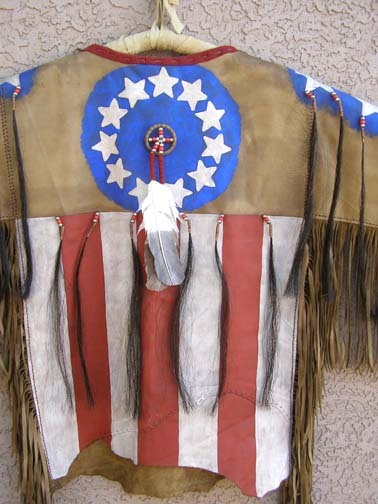 Rudy has used a high grade buckskin hide & hand painted American flag accents & decorated it with lots of fringe & genuine horse hair. 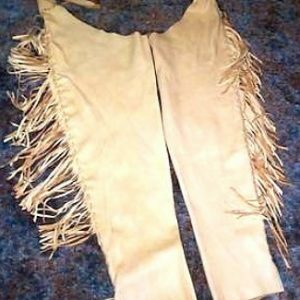 Horse hair is considered good luck to native Americans. 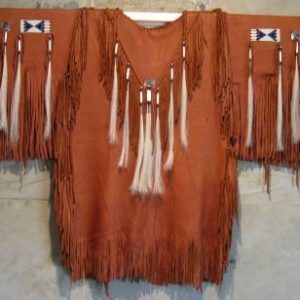 On the front, the bib is a separate piece of leather painted & hand sewn onto the shirt & decorated with a small medicine bundle accented with bone dangles & additional bone beads around the neck. 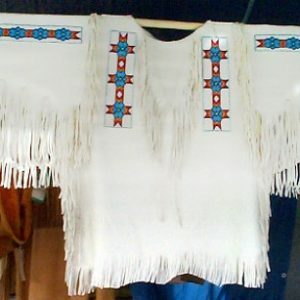 The sleeves are lined in painted blue with white stars with horse hair hanks down the length. 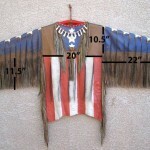 Bold red & white verticle stripes are painted all the way around the shirt. 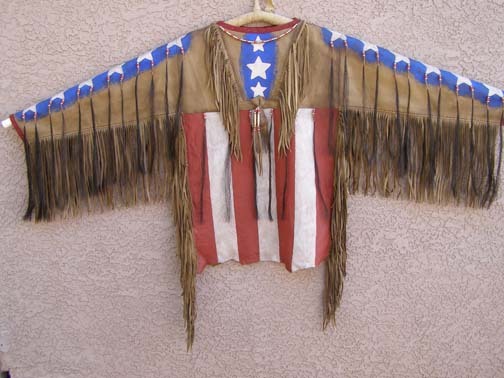 The back of the shirt sports a large blue painted circle with inner circle of white stars & a small medicine wheel with two decorated feathers attached. 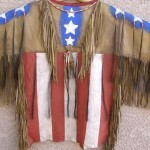 This shirt would make any warrior very proud, especially a veteran ! 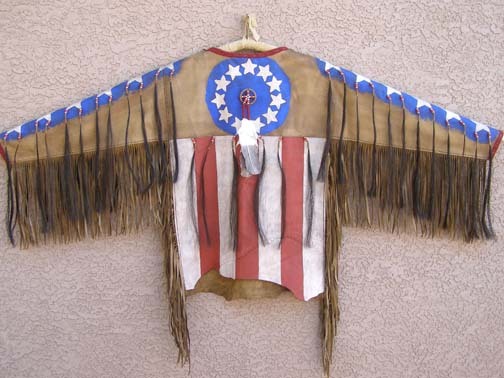 Or, display your native & American pride together & add this to your collection. 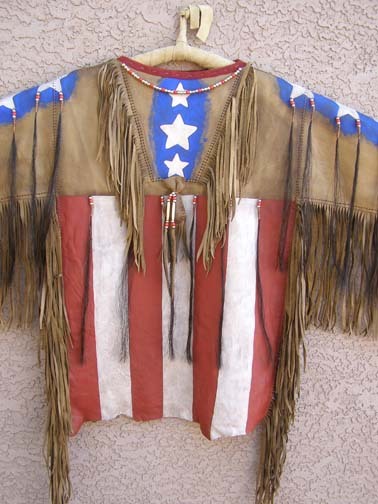 This is a ONE-OF-A-KIND. 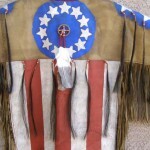 Consider this WARRIOR APPROVED !! 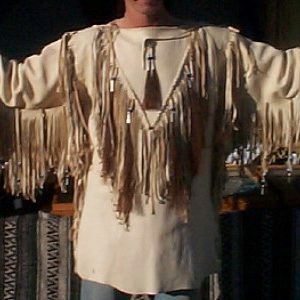 This shirt measures 65 inches wide & 43 inches tall. 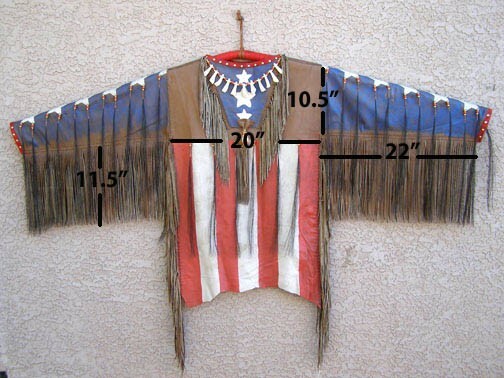 Certificate of authenticity comes with this item.